In 1908 he left for Canada, where he linked up with the Canadian Socialist Party. He later described his first ‘real’ speech, given in Victoria, British Columbia, as a three-hour diatribe ‘on almost every topic under the Labor sun’. On another such occasion, he ended up in gaol. In 1911 he was a Socialist Party candidate for the Canadian House of Commons. Unsuccessful, discouraged by the weakness of the labour movement in Canada, and increasingly disillusioned by the doctrinaire nature of the Socialist Party, Brown returned to England, docking in Liverpool on a ‘wet, cold miserable day’. In 1912 he embarked for Sydney and was soon delivering speeches on socialism. By September, he was secretary of the Sydney branch of the Australasian Socialist Party, but before long had been arrested for ‘illegal’ public speaking in the New South Wales town of Wollongong. In April 1913 Brown and a friend ‘shouldered [their] swags and lightheartedly took the track for Brisbane’. Within a few days of their arrival, they were in gaol, again for speaking without a permit. Becoming the organising secretary of the Brisbane branch of the Socialist Party, and a regular contributor to the International Socialist, in July Brown began a series of organised protests against a ban on secular bodies holding public meetings on Sundays. In June 1914 Brown and his socialist friends organised a civil disobedience rally as part of his free speech movement, but the indifference of the unions to socialist theory and the enlistment of large numbers of working men in World War I caused Brown to lament: ‘Verily, O worker, thy name is Mug’. In 1917 he was involved with the Industrial Workers of the World, travelling around Queensland, especially in Townsville and Toowoomba, in the role of lecturer and ‘stump orator’, thereby earning the disapproval of Prime Minister Hughes. A report compiled in 1922 by the Investigation Branch of the Attorney-General’s Department (at that time responsible for internal security) described him as associating ‘with the worst revolutionary elements of Brisbane’. Another of these reports refers to his advocacy of the ‘One Big Union Propaganda League’ of the ‘Revolutionary Movement’ in Australia, and his failed attempt to get a passport to travel to Petrograd to study Bolshevism firsthand. Prior to the December 1917 conscription referendum, he was employed by the Anti-Conscription Campaign Committee. Now a marked man, Brown wisely took the advice of Queensland minister and Irish firebrand, John Fihelly, ‘to go quietly’. His radical days were over. On 21 December 1914 Brown had married Beatrice Agnes Hinchsliff, at St Andrew’s Presbyterian Church in Brisbane. During 1917 he sold insurance for the Metropolitan Life Insurance Company, attempting, without success, to form a union of insurance agents. By the next year he was an employee with a time payment firm. In the early 1920s, as a salesman for the furniture and drapery business, Finney Isles and Co., he joined the Shop Assistants’ Union, for which he became an organiser and vice-president. He tried but failed to gain preselection for the newly created Greater Brisbane Council in 1924. From 1925 to 1927 he was vice-president of the Trades and Labor Council of Queensland. Brown, who had joined the ALP in 1918, was elected to the Senate at the December 1931 election, at which the three Queensland Senate vacancies all went to the ALP (the first time that the Queensland party had won a seat in the Senate since 1914). In January 1932, attending the Queensland Labor-in-Politics Convention as senator-elect, he made it clear that he was not a J. T. Lang supporter, and also tried, unsuccessfully, to gain a place on the Queensland Central Executive. Between Brown’s election and when he was sworn in the Senate on 31 August 1932, the troubled Labor Government of J. H. Scullin had fallen, replaced in January 1932 by that of the United Australia Party’s (UAP) Joseph Lyons. Joining the depleted ranks of the Opposition that included two Lang Laborites, Brown in his early speeches adhered to official Labor policy as he supported economic protection, nationalisation of industry, a program of public works and a range of social welfare issues, notably relieving the injustice and inequities suffered by old-age pensioners and civilian widows, and the liberalisation of pensions for ex-servicemen. By 1935 he was Deputy Leader of the Opposition in the Senate, a position he held until September 1938. Brown was tall and strongly built, with clear-cut features and a lively expression. Cheerful and often funny in debate, he liked nothing better than a vigorous exchange of views. In September 1936 he was suspended from the chamber for refusing to withdraw a remark that Labor’s President Lynch considered offensive. In May 1939 Brown was suspended again, following a series of clashes with the new President of the Senate, the UAP’s John Blyth Hayes, for refusing to accept the answer of the Leader of the Government in the Senate, George McLeay, regarding payment of an annuity for Enid Lyons, the widow of the recently deceased Prime Minister. Brown accused McLeay of ‘childish evasion’, then asked a question on the ‘poor devils’ who lived in ‘slums’ in Canberra. When reminded that, under standing orders, he could not offer comment while asking a question, Brown replied: ‘I withdraw “poor devils”; I wish to withdraw them from the slums and to house them properly’. When government senators moved for his suspension, Brown fired a parting shot: ‘I ask a question about slums and I am to be turned out of the Senate. Money should not be wasted like this. I shall go out with pleasure’. According to the Courier-Mail, Brown stopped to chat with another senator on the way out, and Hayes, normally the mildest of men, ordered him to ‘get out immediately’. With the outbreak of World War II, Brown became a frequent critic of the Commonwealth Department of Information. In December 1940, shortly before the appointment of Senator Foll to the information portfolio, Brown accused the department of hiding the ‘facts of the war’ from the Australian people, whom, he declared, should be told the truth. He suggested that a lesson be taken from Goebbels, who, he announced, ‘has built up the greatest propaganda machine the world has known’. In September 1942 he called for increased funding for propaganda: ‘We must use our knowledge of mass psychology and the mass mind in order to succeed’. In March 1943 he pressed successfully for the removal of the ban on a film showing grisly scenes of Nazi brutality in Russia, arguing that it was ‘incumbent upon us at all times to arouse the people to a realization of the horrors of war’. Although as a senator I may not always have kept quiet, I have acted decorously when serious matters have been under discussion … When men are suffering from stress and strain, as is frequently the case when dealing with important legislation, no harm is done if occasionally some one addresses the chair in [a] lighter vein. He continued as Chairman of Committees until 23 September 1943, when he was elected President of the Senate. There were no other nominations. Six months earlier Brown had said: ‘After being a member of this chamber for eleven years, I have come to realize that standing orders are necessary … in order that the business of the Senate may be conducted … with all possible speed, and with fairness to all honourable senators’. Brown’s re-election as President, unopposed, in 1944, 1947 and 1950, shows that he fulfilled his desire to be fair-minded in dealing with senators on both sides of the chamber. 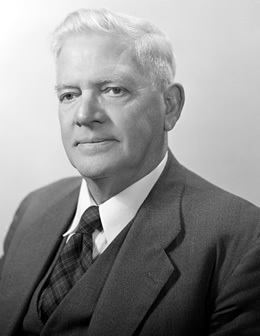 When Senator Sandford applied the term ‘fascist Government’ to the Menzies administration in May 1950, Brown disapproved: ‘It is most undesirable that honourable senators should get themselves into a state of mind in which they cannot respect one another’. In accord with Labor policy, he did not wear the traditional wig and robes of office, remarking that it was a matter of pride that he ‘was able to keep order without the aid of such trappings’. Brown only once suspended a senator. This was during the controversial debate on the National Service Bill 1950 when Senator Reg Wright, instead of withdrawing his statement that Senator Morrow had been expelled from the Tasmanian Labor Party in 1938, said that ‘if the facts are offensive to Senator Morrow I shall only withdraw them on the morrow’. Amid much mirth, Wright continued to ignore the President’s injunction until suspended. Instances of dissent from Brown’s rulings were rare, one such concerning the content of questions during a broadcasting of Question Time. Brown ruled that questions should not provide information, but seek it. He also argued that questions should be succinct in order to fit as many as possible into a broadcast session. Between 1945 and 1950, he resisted attempts from ALP senators Lamp, Grant, Ashley, and Amour to impose restrictions on print media coverage by having the representatives of certain papers, notably the Daily Telegraph, the Tribune and the Canberra Times, barred from the Senate. Despite his humble origins, he was acutely mindful of the status associated with the position he had attained. On one occasion he and J. S. Rosevear, Speaker of the House of Representatives, boycotted a parliamentary dinner for the Governor-General because of a disagreement over precedence. Brown relinquished the presidency on 19 March 1951 upon the dissolution of the Senate. On 12 July 1951, during a debate on the Constitution Alteration (Powers to Deal with Communists and Communism) Bill, Brown suffered a stroke. After speaking for about fifteen minutes on the theme that communism should be eradicated by educational programs rather than by ‘adopting dictatorial and big-stick methods’, Brown paused, asking the President, Senator Mattner, for time to rearrange his papers, before slumping across his desk. Country Party leader and medical doctor, Sir Earle Page, came to his aid from the House of Representatives before Brown was taken to the Canberra Community Hospital. Brown returned to the Senate on 31 October 1951, and served for another fourteen years. Throughout his career, Brown stressed the value of a sunny outlook on life and a sense of humour. His autobiography, My Descent from Soapbox to Senate, was dedicated ‘to those cheerful men and women who render service and who love life and laughter’. In the week that Germany invaded Russia, he had told the Senate that ‘if Hitler had a highly-developed sense of humour, the world would not be in the trouble through which it is passing to-day’. Asking a question on Australian research into rheumatism in 1964, he enquired: ‘Will the Minister be astonished to learn that since sacrificing the palate pleasing pleasure of imbibing beer I have contracted a form of rheumatism, arthritis, or both?’, from which complaint, he claimed, he had not previously suffered. In October that year, Brown tackled the Leader of the Government in the Senate, Shane Paltridge, over remarks made by Senator Gorton that increases in psychiatric problems were linked to an increase in leisure time: ‘Do not senators have a larger amount of leisure time than is enjoyed by members of other callings? If this is so, how does the Minister account for the high standard of sanity in the Senate, the mental calm that pervades its sittings, and the lack of psychiatric problems troubling its members?’ Gorton replied that the high standard of mental stability in the Senate was a matter of opinion. Brown retired on 30 June 1965, completing thirty-three years in ‘one of the best clubs in the country’. He died on 12 January 1967 in Royal Brisbane Hospital and was cremated after a state funeral held in St Philip’s Church of England, Brisbane. Beatrice survived him, as did their three children. Lionel Murphy considered Brown one of the most colourful men ever to enter the Senate, one who hated hypocrisy and fought for the underprivileged. Few senators seem to have enjoyed their tenure in office more. Gordon Brown, My Descent from Soapbox to Senate, Co-operative Press, Brisbane, 1953, pp. 22, 26, 29–33, 56–9, 64–7; Nicholas Brown, ‘Brown, Gordon’, ADB, vol. 13; Courier-Mail (Brisb. ), 13 Jan. 1967, p. 3; People (Syd. ), 17 Jan. 1951, p. 9; CPD, 1 Oct. 1941, p. 600. Daily Mirror (Syd. ), 2 July 1941, p. 4; Brown, My Descent from Soapbox to Senate, pp. 88, 90–1, 93, 100, 103–4, 106; Library of Parliament (Canada), History of Federal Ridings since 1867, Parliament of Canada, viewed 25 Feb. 2009, <http://www.parl.gc.ca/information/about/process/house/hfer/hfer.asp?>; People (Syd. ), 17 Jan. 1951, p. 10; International Socialist (Syd. ), 11 May 1912, p. 3, 18 May 1912, p. 3, 7 Sept. 1912, p. 4, 28 Dec. 1912, p. 4, 4 Jan. 1913, p. 3, 25 Jan. 1913, p. 4. Brown, My Descent from Soapbox to Senate, pp. 125, 128–31, 162; International Socialist (Syd. ), 26 Apr. 1913, p. 4, 24 May 1913, p. 4, 12 July 1913, p. 4, 13 Sept. 1913, p. 4; Courier Mail (Brisb. ), 13 Jan. 1967, p. 3; Raymond Evans, Loyalty and Disloyalty: Social Conflict on the Queensland Homefront, 1914–18, Allen & Unwin, Sydney, 1987, pp. 18, 67–8, 133, 136; International Socialist (Syd. ), 15 Nov. 1913, p. 4, 22 Nov. 1913, p. 4, 6 Dec. 1913, p. 2, 30 May 1914, p. 4, 6 June 1914, p. 4, 17 Oct. 1914, p. 4; Verity Burgmann, Revolutionary Industrial Unionism: The Industrial Workers of the World in Australia, CUP, Cambridge, 1995, p. 160; Commonwealth Investigation Branch reports, Summary of communism vol. 1, Summaries no. 1–25, June 1922–Dec. 1923, A6122, 111, pp. 15–21, NAA. Brown, My Descent from Soapbox to Senate, pp. 165, 168, 175–7; Worker (Brisb. ), 2 Dec. 1931, p. 16; Queensland Shop Assistant, 27 Feb. 1924, p. 14; Daily Standard (Brisb. ), 20 Jan. 1925, p. 6; Trades and Labor Council of Queensland, Minutes of annual meetings, 15 July 1925, 29 July 1926, M54, reel 1, NBAC, ANU; Daily Mirror (Syd. ), 10 Feb. 1982, p. 62; ALP, Official record of the 14th Queensland Labor-in-Politics Convention, 1932. CPD, 24 Apr. 1936, pp. 890–7, 8 Sept. 1937, p. 685, 28 Mar. 1935, pp. 409, 411, 413, 29 Mar. 1935, pp. 503–5, 27 May 1942, pp. 1515–17, 2 Dec. 1936, p. 2585; Patrick Weller (ed. ), Caucus Minutes 1901–1949, vol. 3, MUP, Carlton, Vic., 1975, p. 499. Senate, Journals, 17 Sept. 1936, p. 241, 17 May 1939, p. 175; CPD, 17 May 1939, pp. 359–61; Courier-Mail (Brisb. ), 18 May 1939, p. 1. CPD, 6 Dec. 1940, pp. 523–4, 29 Sept. 1942, p. 1042, 11 Mar. 1943, p. 1534, 17 Mar. 1943, p. 1797. Senate, Journals, 1 July 1941, pp. 84–5; CPD, 1 July 1941, p. 571; Senate, Journals, 23 Sept. 1943, p. 3; CPD, 9 Mar. 1943, p. 1322. CPD, 6 July 1950, p. 4831, 31 May 1950, p. 3410; Brown, My Descent from Soapbox to Senate, p. 276; CPD, 8 Mar. 1951, pp. 133–6, 11 May 1950, p. 2419, 16 May 1950, pp. 2586–7, 2615–16; Rulings of the President of the Senate, the Hon. Gordon Brown, 1943–1951, vol. 9, Government Printer, Canberra, [c. 1951], p. 8; CPD, 26 Sept. 1945, p. 5867, 27 Sept. 1945, pp. 5988–91, 25 Mar. 1947, pp. 1054–5, 26 Mar. 1947, pp. 1148–50, 14 June 1950, pp. 4184–5, 19 Oct. 1950, p. 1031; SMH, 2 Mar. 1945, p. 3. CPD, 12 July 1951, pp. 1507–9; Courier-Mail (Brisb. ), 13 July 1951, p. 1; CPD, 31 Oct. 1951, p. 1311. CPD, 27 June 1941, p. 524, 17 Sept. 1964, p. 524, 28 Oct. 1964, p. 1331; Brown, My Descent from Soapbox to Senate, p. 270; Courier-Mail (Brisb. ), 13 Jan. 1967, p. 3; CPD, 21 Feb. 1967, p. 16. This biography was first published in The Biographical Dictionary of the Australian Senate, vol. 3, 1962-1983, University of New South Wales Press Ltd, Sydney, 2010, pp. 269-274.